The National Strategic Selling Institute, NSSI, in the Kansas State University College of Business Administration is set to host its fourth annual benefit auction on Friday, April 29, at the Houston Street Ballroom. The event is being organized by students in the institute’s advanced sales class, in conjunction with Pi Sigma Epsilon, the sales and marketing business fraternity. Students work together to find items for the auction and sell tickets to the event. This year the organizers voted to split the net proceeds with Kansas Big Brothers Big Sisters of Riley County, with the other half going toward the NSSI Sales Cup Merit Awards. Those merit awards go to students who have earned performance points through their classes and participation in sales competitions, networking events, workshops and other institute events. This year’s theme is “Viva Las Vegas!” and attendees will have the opportunity to play games and win chips for raffles throughout the night. The doors to the event will open at 5:30 p.m., with a catered meal from Wahoo Fire & Ice Grill beginning at 6:30 p.m. A cash bar will be available throughout the evening. The auction portion of the event begins at 7:30 p.m., and will feature a live auction, hosted by 2001 K-State marketing alumna Michelle Canny of the Canny Team, with items ranging from suite tickets to a home K-State football game to a golf outing. A silent auction will feature signed sports memorabilia and a variety of gift baskets. 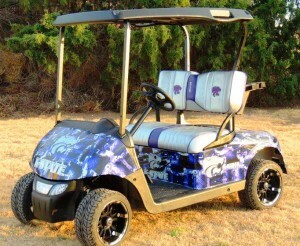 The featured event of the night will be a raffle for a customized K-State-themed golf cart. The minimum donation to attend is $25, but opportunities exist to buy a sponsored table, donate an auction item, purchase a raffle ticket, or to sponsor the meal of an advanced sales student. Find additional information about sponsorship opportunities online. To donate an item or purchase tickets, please contact Deeter at ddeeter@k-state.edu.